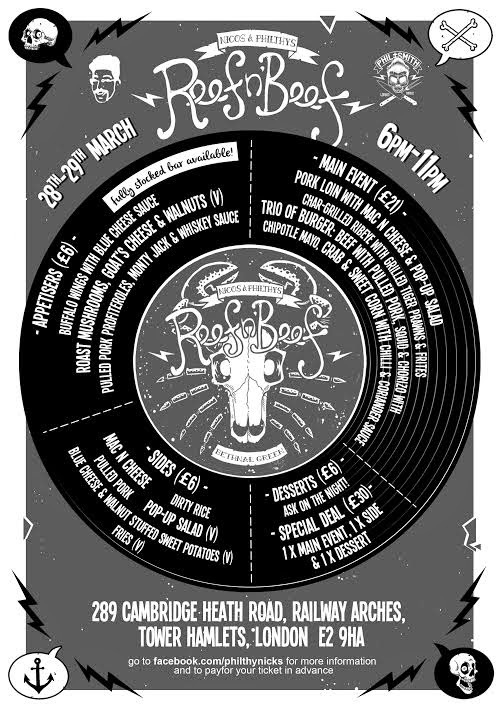 Nicos and Philthy are back for another Surf 'n' Turf - they call it Reef 'n' Beef - pop-up following the success of their two sold-out nights in Camden earlier this month. The menu is similar, but this time it's in a bigger space - The Arch Gallery in Bethnal Green, over two nights. £30 gets you in, with a side, a dessert - pay for cocktials, extra sides, appetisers and desserts on the night. I went last time and it was brilliant - you won't be disappointed. See the video for more information! "Nicos and philthy are back for another 3 days only!! After our last two days at our sold out first event at the Dandelion cafe Camden we are going to a bigger venue in Bethnal green for 2 days. £35 gets you access to our unique dining experience. a gargantuan main meal, with sides/ dessert and one of our custom cocktails. 12.5% service charge will be added to your bill. we will also be introducing custom cocktails with our fully stocked bar."